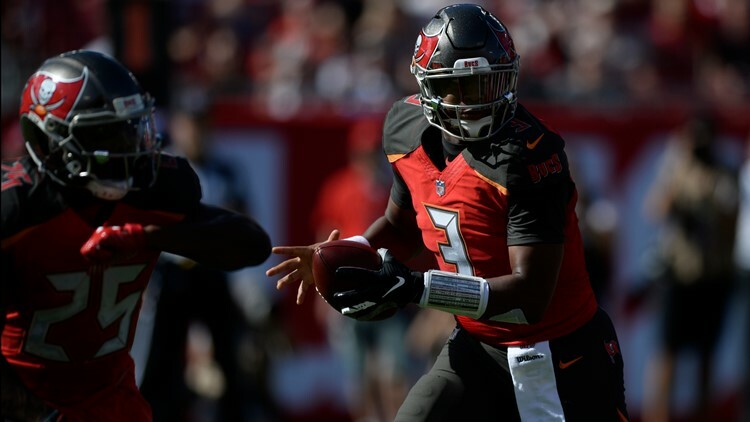 Tampa Bay Buccaneers quarterback Jameis Winston (3) fakes a handoff against the Atlanta Falcons during the first half of an NFL football game Sunday, Dec. 30, 2018, in Tampa, Florida. LONDON, ON — The NFL announced the time, date and location of the Tampa Bay Buccaneers' 2019 international series. The Buccaneers are scheduled to play the Carolina Panthers at 9:30 a.m. ET on Oct. 13 at Tottenham Hotspur Stadium in London. The stadium serves as the home of the English Premier League team Tottenham Hotspur. The game will mark the second-ever NFL contest held at Tottenham Hotspur Stadium. San Francisco, Sept. 8, 4:25 p.m.
@ Carolina Panthers, Sept. 12, 8:20 p.m.
New York Giants, Sept. 22, 4:05 p.m.
@ LA Rams, Sept. 29, 4:05 p.m.
@ New Orleans Saints, Oct. 6, 1 pm. @ Tennessee Titans, Oct. 27, 1 p.m.
Arizona Cardinals, Nov. 10, 1 p.m.
New Orleans Saints, Nov. 17, 1 p.m.
@ Atlanta Falcons, Nov. 24, 1 p.m.
@ Jacksonville Jaguars, Dec. 1, 1 p.m.
Indianapolis Colts, Dec. 8, 1 p.m.
@ Detroit Lions, Dec. 15, 1 p.m.
Atlanta Falcons, Dec. 29, 1 p.m.